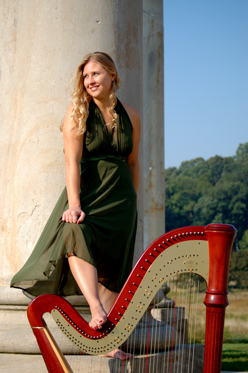 "a perfect fit for the idyllic wedding of my dreams"
Capitol Strings harpist, Rachel Allen has been playing the harp since 1996 when she began studying privately with freelance and symphony harpists. During her harp career, she has performed for weddings, receptions, parties, intimate dinners, and large corporate events. Rachel specializes in light classical, pop and show tunes, holiday, and Celtic music. Rachel is available for professional bookings in the greater metropolitan D.C. area for weddings, receptions, showers, corporate dinners and parties, memorials, or any social function requiring a touch of class and elegance.